Tax payers with annual income of more than Rs 10 lakh will not get subsidised cooking gas (LPG) from next month as the government on Monday decided to limit supply of under-priced fuel to cut subsidies. At present, all households are entitled to get 12 cylinders of 14.2-kg each at subsidised rate of Rs 419.26, while the market price is Rs 608. The government had asked well-off people to voluntarily give up using subsidised LPG and instead buy cooking fuel at market price, Oil Ministry said in a statement. So far, over 57.5 lakh LPG consumers, out of nearly 15 crore customers, have given up subsidies. "While many consumers have given up subsidy voluntarily, it is felt that consumers in the higher income bracket should get LPG cylinders at the market price," the statement said. The government, it said, "has decided that the benefit of the LPG subsidy will not be available for LPG consumers if the consumer or his/her spouse had taxable income of more than Rs 10 lakh during the previous financial year computed as per the Income Tax Act, 1961." This would, however, be done initially on "self-declaration basis while booking cylinders from January 2016 onwards." 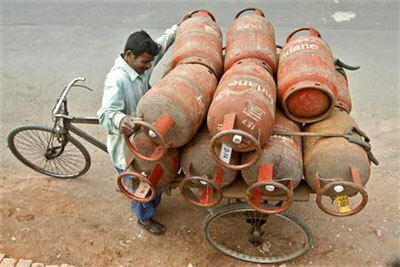 To cut subsidy bill and reduce fiscal deficit, the previous United Progressive Alliance government had restricted the number of subsidised domestic cylinders per household to six every year in September 2012, revising it to nine the following January. The cap was revised in January 2014 to 12 cylinders a year, starting April 1. The subsidy for 12 cylinders in a year is paid directly in the bank account of consumers which they use to buy LPG at market rate. The subsidy payout on LPG in 2014-15 was Rs 40,551 crore (Rs 405.51 billion), which this fiscal will be less than half as oil prices have slumped to six year low. During April-September, the subsidy outgo was Rs 8,814 crore (Rs 88.14 billion). There are no estimates of how many LPG customers would have a taxable income of Rs 10 lakh or more. Presently, there are 16.35 crore LPG consumers in the country. This number fell to 14.78 crore after the start of Direct Benefit Transfer on LPG (DBTL) scheme which eliminated duplicate and inactive customers. "The objective of the scheme was to ensure that the subsidy benefits go to the targeted group," the statement said. The government had also given a call to the well-to-do households for voluntarily giving up LPG subsidy. "So far, 57.50 lakh LPG consumers have opted out of LPG subsidy voluntarily heeding the call given by the prime minister," it said. The subsidy saved from the 'GiveitUp' campaign is being utilised for providing new connections to the BPL families under the 'Giveback' campaign. This enables provision of LPG, a clean fuel, to poor households by replacing the conventional fuels such as kerosene, coal, fuel wood, cow dung, etc, relieving the poor of the hardships and health hazards from such fuels.